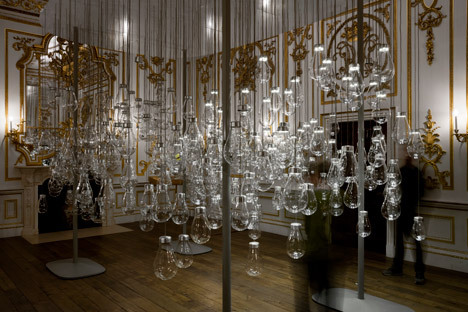 London Design Festival 2015: Vienna studio Mischer'Traxler has filled an ornately decorated room at the V&A museum with glass bulbs containing hand-made insects, which flutter around inside in response to the movement of visitors (+ slideshow). 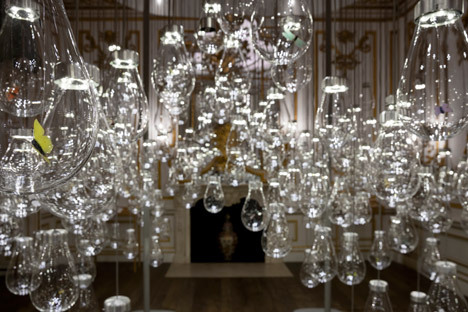 The interactive Curiosity Cloud installation by Mischer'Traxler reacts to passers by with light and sound, and was created as part of an ongoing collaboration with champagne brand Perrier-Jouët. 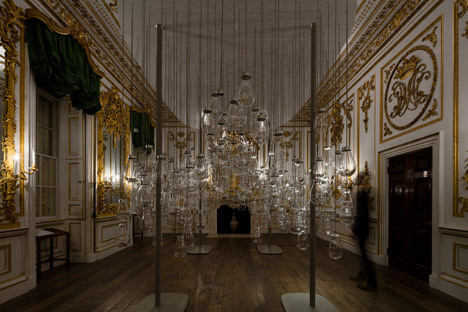 Located in the museum's Norfolk House music room, it comprises 264 blown-glass balloons made in three different sizes and suspended at different heights from the ceiling. 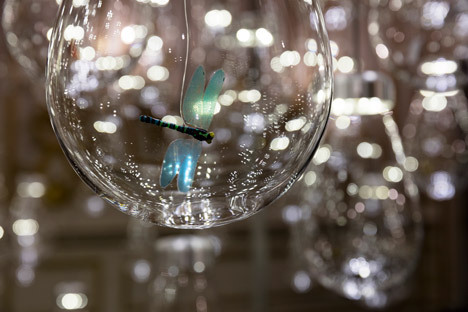 Each contains a hand-made model of a insect connected to a short wire and a ring of LEDs around the top. Using sensors to detect visitors walking past or between the bulbs, the lights turn on and the artificial bugs buzz around inside in response to movement. 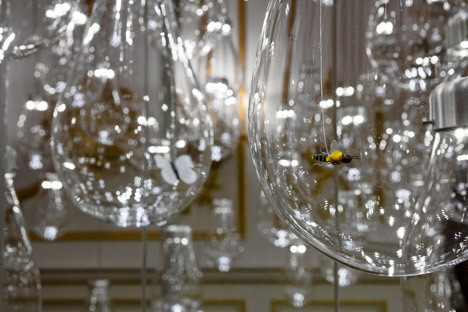 Taking cues from Perrier-Jouët's links to the Art Nouveau style – from the brand's collection of artefacts to the graphics that decorate its bottles – the duo decided to use insects as the central theme. "We wanted to focus on insects because there are an awful lot of insects in Art Nouveau, in marquetry and in the furniture pieces," studio co-founder Thomas Traxler told Dezeen. As the insects touch the glass, they create a sound that builds to a cacophony as more are activated. 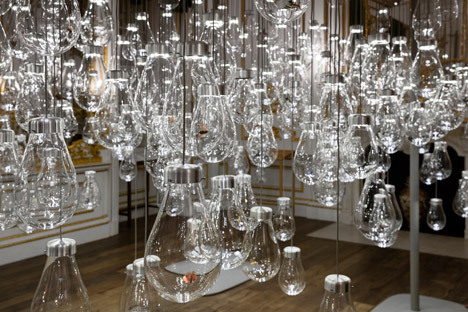 The different sizes of the mouth-blown glass bubbles create different tones of sound as the flying creatures hit the sides. The buzzing noises can be heard outside the space, enticing visitors inside the gilded room. The 25 different types of insect used are modelled on a mix of extinct and endangered species, commonly found types, and newly discovered varieties. They are made from transparent printed foil that is laser cut to achieve the detail and then assembled by hand. The butterflies and moths have fluffy bodies made out of felt, so the sound created also depends on the insect. 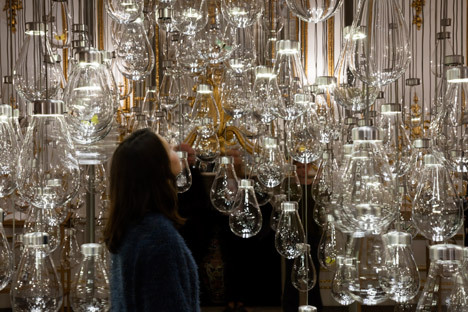 "It's an interactive installation that tries to create a moment that we would never have in reality with nature, but tries to capture a special moment that we do encounter in nature," said Katharina Mischer, the studio's other co-founder. "It creates this atmosphere of sound and movement." For the studio's Small Discoveries collaboration with Perrier-Jouët, Mischer'Traxler has already created a table covered in plants that disappear as visitors approach and a champagne flute that causes bubbles to stream from a small engraved moth. 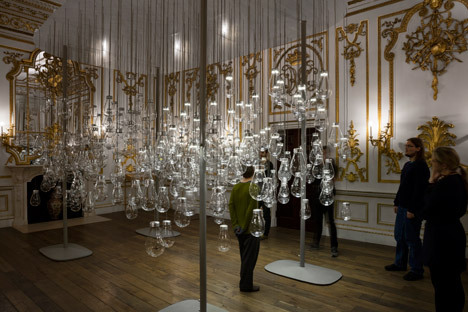 Curiosity Cloud will remain in place for the duration of this year's London Design Festival, which run from 19 to 27 September 2015. 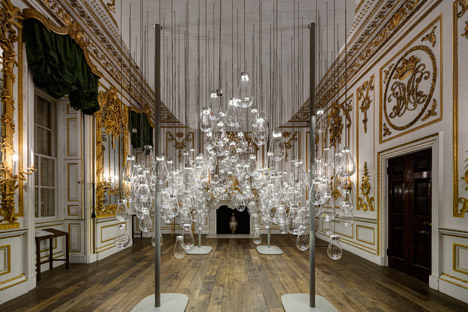 As a hub venue for the event, the V&A is hosting a variety of installations that include a giant crystal zoetrope, a tower of tiny ceramic shops and rows of textured concrete monoliths. 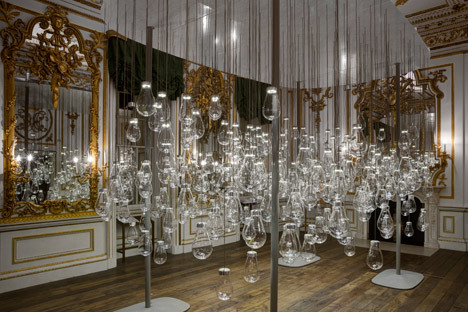 The post Mischer'Traxler fills V&A room with interactive glass bubbles for Curiosity Cloud installation appeared first on Dezeen.